At MG Road metro station I noticed two notices posted at the entrance. 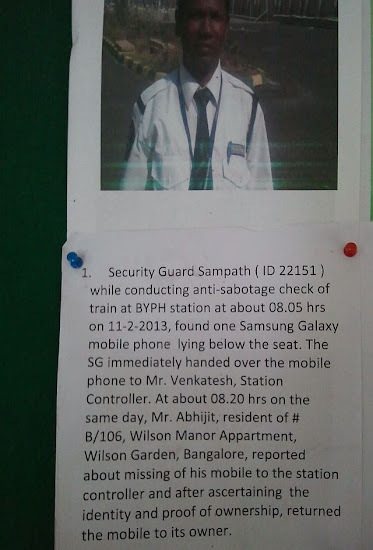 Each one features the picture of a Namma Metro security guard and tells how they acted with honesty and integrity when they returned valuables to their owners. Thank you for the post. I have only read a couple from your blog but made me extremely happy to see someone appreciate Bangalore and its people. I had a similar incident at the bangalore airport recently when I left my laptop in one of the trolleys and realised it many hours later. To my surprise, it was promptly returned to lost and found by one of the security personnel. Thanks for visiting Priti. I'm glad the security guards at the airport returned your laptop! Please come look through my window again soon! People love to be famous for good reasons, even if it is in a small crowd. 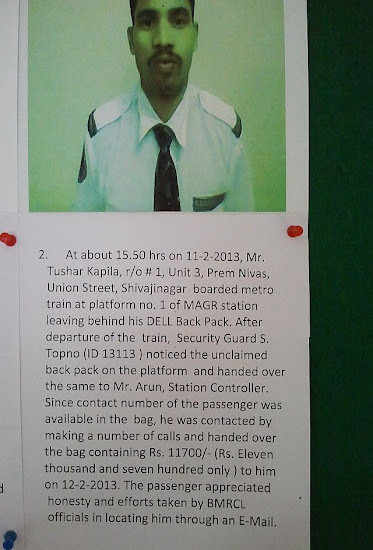 The fact that the metro put up his picture and his deed is a way to show that honesty is appreciated among the employees. This encourages others to be honest too.